You'll be £30.00 closer to your next £10.00 credit when you purchase Total Onslaught. What's this? The end of the Second World War may have heralded peace in Europe but conflicts in Southern Africa were about to begin. The imperial powers were weakened by the cost of war and a string of wars challenged colonial rule in countries such as Namibia, Angola and Rhodesia. Once independence was achieved, civil wars between rival factions unfamiliar with democratic principles resulted. Liberation movements such as those in South Africa demanded self-rule and end to Apartheid. Tribal feuds, corruption and the ambitions of dictators led to more conflicts such as the protracted fighting in the Congo. These were wars that ran on until both sides were exhausted often only to be re-kindled after short periods of uneasy peace. The cost in human and material terms has been devastating and in too many cases remain so. Economic development has been frustrated and the result is often poverty, abuse and genocide. The Author who knows Southern Africa as a native is superbly equipped to tell this fascinating if tragic record. This is the inestimable favour that Prof Paul Moorcraft has done us with this erudite, wide ranging, insightful and brilliantly timed book which revisits that far off landscape through fresh eyes. Prof Moorcraft has been more at home in his other books describing events through his own experiences as a journalistic witness. He was at the front line of early events in Afghanistan for example, travelling through 'bandit' territory. Total Onslaught on the other hand is a thoroughly academic work, deeply researched (with an impressive bibliography) but written in a very accessible style. The narrative carries us forward from the days of Pax Britannica, the 'winds of change', the colonial wars in Angola, Namibia, Mozambique and Rhodesia and finally to war in South Africa itself, concluding with the overthrow of President Mugabe and the end of the Zuma era. Bang right up to date. ...Prof Moorcraft's speciality is military history and tactics and his analysis of events is offered through the prism of a military historian. Time and again the reader is struck by a fresh insight into the reasons behind events which have seemed familiar. The military industrial complex in South Africa is credited with playing a much greater role in the actual ending of apartheid than the hapless revolutionary forces of the ANC and Moorcraft is careful to cite respectable authorities in this regard. The sense of pragmatic military calculation having been behind so much of the 'action' in smoky backrooms where policy was worked out by the Afrikaner nationalists is reinforced throughout Moorcraft's analysis. The public may have thought starry eyed ideologues were the driving force of change, but in fact it was the hard-headed strategists in the French, British, Portuguese, South African, Israeli, Cuban and Soviet military that called the shots and laid out options leading to all the subsequent important political choices. 'Total Onslaught' is highly recommended. A must-read for anyone seriously interested in the post war history of southern Africa. This authoritative book…is part grand narrative and part personal recollection as he interviewed a large number of the protagonists and participants in these long conflicts…Broad lessons for counterinsurgency (both in theory and practice) are embedded in the text, although Moorcraft is careful to emphasise the unique aspects of each state…Overall this book is for the generalist rather than the specialist…He presents a sustained and powerful argument of creeping militarisation in the process of policy formulation…There are many warnings from history in this book, most of all, on the danger of attempts at military solutions to political problems…His trenchant conclusion is that “appalling governance has emasculated the continent”. It is hard to argue with this judgement. 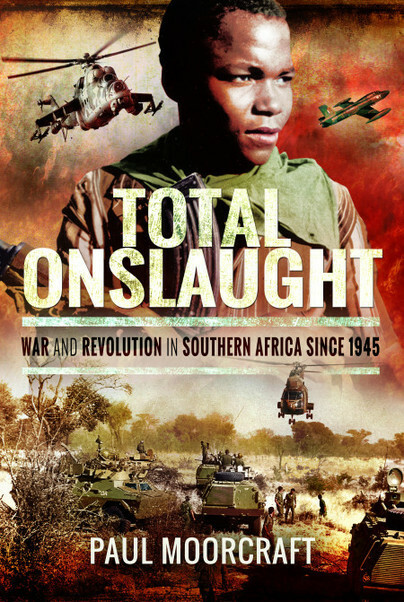 Total Onslaught is a very welcome addition to scholarship on conflict in Africa, a continent rapidly emerging as of pivotal strategic, political and economic interest to Europe... This book will become compulsory reading not just for aspiring foreign correspondents but also in western (and African and Chinese) military academies.